Learn more about the Americas Alliance Partner Schools, immersions and projects. Through the Global Immersion Track program you will gain experience working with professionals in the four largest economies in the Americas – Brazil, Canada, Mexico and the U.S. The business cultures in each of these four countries are extremely unique and this Global Immersion Track program will help you develop the skills and international mindset that is critical to operating successfully in the international business market. Brazil boasts the largest population in Latin America and the fifth in the world. A global melting pot, Brazil is a blend of early and recent immigrants from Portugal, Africa, Europe, the Middle East, Japan and Asia. Over 80 percent of the population lives in urban areas, predominantly in the south. Brazil has one of the most advanced and diverse industrial sectors in Latin America, including automobiles and parts, machinery and equipment and textiles. This vibrant country has earned a reputation as a leader in corporate social responsibility with companies at the leading edge of leveraging environmental programs to gain competitive advantage. In Brazil, the curriculum will focus on marketing and corporate social responsibility. Area 3.3 million square miles, slightly smaller than the U.S.
Mexico is the second most-populous country in Latin America after Brazil. The population is predominantly native Mestizo with a significant portion of Amerindian; more than 75 percent live in urban areas situated primarily in the center of the country. An interesting facet of the Mexican economy is the preponderance of family-owned businesses. As NAFTA is evolving, this landscape is changing. As family-owned businesses are looking to grow and become players in the global market, they are adopting more traditional ownership forms or entering into partnerships with transnational companies. In Mexico, the curriculum will focus on strategic pricing and family-owned businesses. With the equivalent of $1.6 billion (U.S.) in goods crossing the border every day, Canada and the United States boast the world's largest and most comprehensive trading relationship. Canada is the leading export market for the U.S., accepting more goods than the 27 EU countries combined. Conversely, Canada is the single largest foreign supplier of energy to the U.S., providing approximately 20 percent of oil and 18 percent of natural gas imports. A relatively affluent society, Canada offers a market-oriented system similar to that of the U.S. Combined with low tax rates, its strategic location as the crossroads between North America and Asia, and a sophisticated transportation infrastructure, Canada has been named the #1 place to do business in the G7 through the year 2014 by the Economic Intelligence Unit. 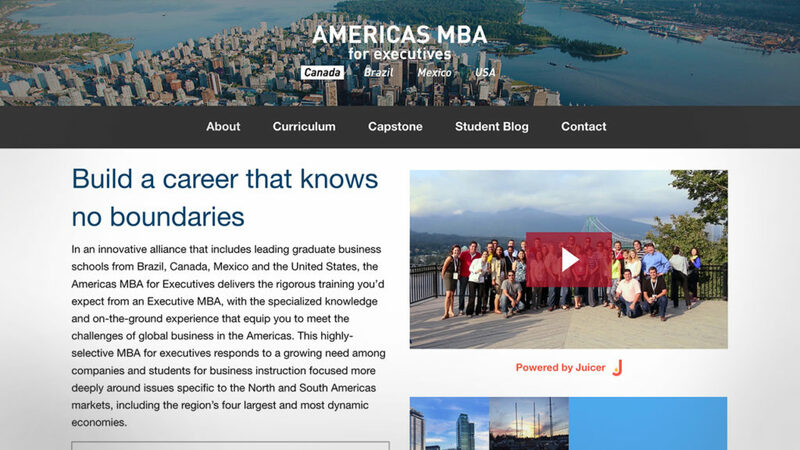 In Canada, the curriculum will focus on international business strategy and cross-cultural management. Slightly larger than China and almost two and a half times the size of the European Union, the United States is bordered to the north by Canada and to the south by Mexico, two of its largest trading partners. Slightly over 80 percent of Americans live in urban areas; 47 of the 50 fastest-growing metro areas are located in the South or West. As a market economy with strict regulatory oversight, the country is balanced between privately held and publicly traded companies. The United States has the largest GDP in the world, comprising approximately 24 percent of the gross world product. A relatively affluent society, the country ranks ninth in the world in per capita GDP. The U.S. is the largest importer of goods in the world and the third largest exporter. In the United States, the curriculum will focus on innovation and entrepreneurship.